The $1.28 billion 10-year balloon is reportedly close to being done. Bank of America will refinance the 51-story office tower it co-owns with the Durst Organization on Bryant Park with help from J.P. Morgan Chase & Co., sources close to the deal said. The refinancing comes a mere 10 months after the owners refinanced the Bank of America Tower at One Bryant Park with a $1.28 billion, three-year loan. Sources say this time the owners are seeking a 10-year loan for $1.3 billion that will be partially securitized and sold to a variety of investors. 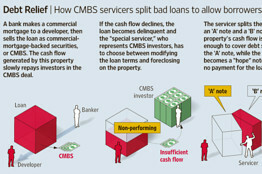 The WSJ had a cute little article and imagery regarding CMBS loan mods. Nothing groundbreaking, but I didn't want to be accused of missing a story about CMBS in the MSM again. There was a reminder in there that Fitch's highest loss projection on any one deal is just 11.7%. This number is trotted out right before they compare it to an annualized default rate, but describe it as a cumulative default rate (comparing it to a Loss rate, nonetheless). To cement their lack of understanding in the CMBS market, they later make a reference to the early-90s, which had an AVERAGE loss rate of 8% (and they think Fitch's CMBS worst deal forecast of 11.7% is reasonable enough to put into print). April 23 (Bloomberg) -- Manhattan’s Stuyvesant Town and Peter Cooper Village apartments, the city’s largest residential enclave, could be sold in two pieces under a court proposal filed by lenders. Debt due on the properties has now ballooned to $3.66 billion, according to a filing in U.S. District Court in New York. S&P finally applied appropriate D ratings to 14 classes in the ESH deal, up to the A4. Interestingly, there is nothing new in the S&P review that we didn't write about as far back as December 2008, and it's not because we are overly bright or have exposure to the deal. It is because it has been obvious it would fail to most folks for some time. GSMS 2007-EOP $4.9 billion getting restructured? April 22 (Bloomberg) -- Blackstone Group LP may ask creditors to restructure $4.94 billion of debt remaining from its 2007 purchase of Sam Zell’s Equity Office Properties Trust, according to two people familiar with the discussions. Blackstone would consider paying down about 5 percent of the balance and agreeing to a slightly higher interest rate in exchange for extending the maturity, according to the people, who declined to be identified because the talks are private. The debt, which was packaged and sold as a commercial mortgage-backed bond in June 2007, matures in 2012, according to data compiled by Bloomberg. Blackstone also sold EOP real estate Seattle, including 17 office buildings to Boston-based Beacon Capital Partners in 2007. Additional EOP sales were made in Diego and Portland, Oregon. We should note that we looked at the financials in 2007 and 2008, and they were so screwed up even BoA (the servicer and lead) couldn't even tell us which properties were contributing how many dollars (a bunch were JVs) each period and what the actual debt service ratios were. You really couldn't even tell which properties were still contributing cash and which had been flipped, and it became apparent that BoA didn't know either. Even after spending a weekend with the financials and your own due diligence, there simply was too much misinformation and bad information that you couldn't nail anything down. I think it was intentional, and I didn't buy any bonds purely based on the lack of information issues, not even mentioning the credit issues. Oh I wish I could remember the names of the individuals and I'd publish them. The Moody's Real CPPI dropped 2.6% in February - following three months of increases. It's off 41.8% from the peak. Uniqlo (We'll have to ask my wife what type of retailer they are - ADR FRCOY) got a 1/3 off deal on their rent at 666 Fifth Avenue (several deals) for the street level retail at just $20mm per year (down from $30mm asking). It's being touted as a record breaking deal, but it's not clear which record is being broken - there certainly have been larger over all deal sizes, and the price per square foot doesn't seem like a record breaker... In fact, the square footage must be wrong. It's listed as 89,000 everywhere I look, but that's just $224 psf - there are plenty of leases at $2,000 psf for fifth avenue retail (Abercrombie & Fitch is in the same building at $2+k, although their space is dark). There is an extra zero somewhere in there. Actually, I don't think the floor has that much space available. Abercrombie is out, Brooks Bros. is out. Maybe it stretches up into the office space and actually helps out the CMBS loan (which does not include retail) - the $psf might actually make more sense that way too (assuming the 89k is correct). It could be - I see they have a 51k square foot space at 546 Broadway (JPMCC 2007-LDPX). David Bianco, of the esteemed firm BAML, head of US Equity Strategy, informed us this morning (on our ride in on Bloomberg Radio, in between their primary programming that consists primarily of advertisements and PSAs urging us not to collect fire wood) that we're just in a Pessimism Bubble, and everything is really much better than you think. Get all-in on Equities or you're going to miss the boat. On CRE, the interviewer (Tom Keene I think) asked "what are you seeing in CRE that all the pessimists are missing" (paraphrasing a bit). Bianco, "investors are willing to pay a dear price for income producing properties... even given the negative rent outlook, people are capitalizing income producing properties at very low cap rates... this is supportive of the loan book the big banks have of their big properties...", or something like that. When cap rates get as low as they were, investors aren't valuing income, they're valuing speculation. I agree regarding the investment dollars chasing deals - you can't buy CRE in any form today without overpaying. His entire interview made me more pessimistic on everything from equities to CMBS. I'd short BAC in response, but their "earnings" improved, mostly due to the Merrill acquisitions - ugh, I threw up in my mouth a little bit just now. In connection with the acquisition, SL Green will assume $49.85 million of in-place financing. The 5.74% interest-only loan matures in March 2014. Pretty sure that's not a CMBS loan. Not sure whose it is. Where's the good news driving this? EQR buys 425 Mass (fka Dumont) for $167mm from Broadway. 559 units. This follows the two NYC apartment purchases earlier this year, and an in place agreement to pick up a third one from Macklowe. $425mm loan in two pari passu notes in GECMC 2007-C1 ($175mm) and CD 2007-CD4 ($250mm). 3Q 09 DSCR - 0.45x. The headline reads "First CMBS conduit deal in two years nears pricing". I didn't read anything else - it's got like 5 loans, 2 property types, and 5 states - when did that become a conduit deal? It's 50% advertisements (on Sirius/XM no less), 25% sports, 10% weather, and like 15% news - on a good day. I'd pay twice as much for one channel that was 100% news with a business slant - I thought that was their business model?!? On a bad day, starting today at 2pm ET in fact, they're switching to 100% sports - golf no less. I'm not a golfer, so I'm biased - the last time I played was on the gulf coast in the 90s and I really enjoyed the cute girl who brought me beers, but that was it. That being said - HOW does one enjoy a good game of golf over the radio? I spend more each month to receive Bloomberg information than any other news-like service, from various inputs including their desktop software, radio, and DirecTv for the office TV. I spend more on them than a lot of Americans take home in salary each month, and they deliver me Golf? Further, they no longer hire cute sales reps to deliver the message (much less a beer) - for whatever reason our Bloomberg sales reps are now just a rotating door of young guys fresh out of college. Something's got to give - bring back the old sales rep hiring model, get rid of golf and the deluge of book advertising on my f'in business news radio that I pay hard dollars for, or I'm going to quit paying so much to your firm! Most recently, the company's Prime Group Realty Trust affiliate started talks to give up the Continental Towers, a 932,854-square-foot office building at 1701 Golf Rd. in Rolling Meadows, Ill., which serves as collateral for a $115 million securitized mortgage. Meanwhile, Lightstone said it expected to lose, likely through foreclosure, four malls that secure $88.8 million of debt, including $73.2 million that was securitized through JPMorgan Chase Commercial Mortgage Securities Trust, 2006-CIBC15. The four properties, Martinsburg Mall with 552,212 sf in Martinsburg, West Va.; the 507,836-sf Shenango Valley Mall in Hermitage, Pa.; the 476,778-sf Mount Berry Square Mall in Rome, Ga., and Bradley Square Mall, with 406,845 sf in Cleveland, Tenn., have been in receivership since last year. Foreclosure proceedings will also likely begin soon against the two shopping malls, the Macon Mall, with 1.4 million sf in Macon, Ga., and the Burlington Mall, with 419,000sf in Burlington, N.C., that serve as collateral for $164.6 million of debt, including $137.7 million that was securitized through Wachovia Bank Commercial Mortgage Trust, 2005-C20. Wachovia owns a $17.3 million mezzanine loan, while Presidential Realty Trust owns a $9.5 million loan. Lightstone also said it will lose to two regional malls in Lake Jackson, Texas, and Shawnee, Okla., to foreclosure. The $47.2 million of debt, including $7.7 million of mezzanine debt, on the properties matures in January. The Texas property was scheduled for a foreclosure sale last week.